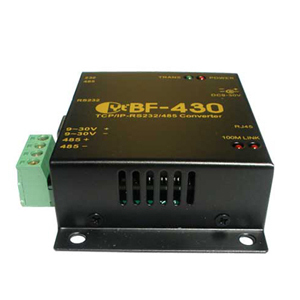 The BF430 is an advanced industrial strength Serial to Ethernet Converter with RS232 and RS485 interfaces which allows you to connect any serial device over a local LAN network or over the Internet to your computer. 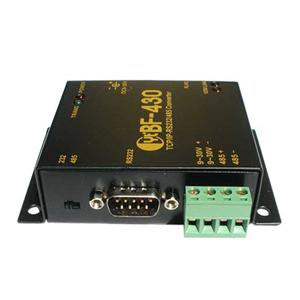 This Serial to Ethernet converter has one RS232 port and one RS485 port, both can be configured by software. 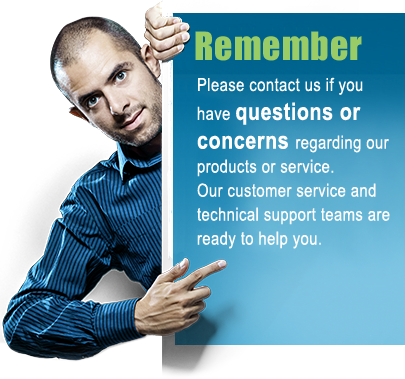 The standard port parameters and other more advanced parameters can easily be configured remotely or locally by the included virtual COM software or by logging into the converter by using a standard web-browser. 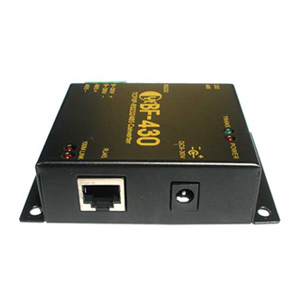 By integrating RTOS (Real Time Operating System) and complete TCP/IP protocol stack capability, this Serial to Ethernet converter provides not only an advanced and high performance system integration to connect your devices to your network, but also allows for easy installation and access. This converter is fully capable to handle more complex setups such as Serial Tunneling mode, communication without virtual COM software, access over Internet and more. 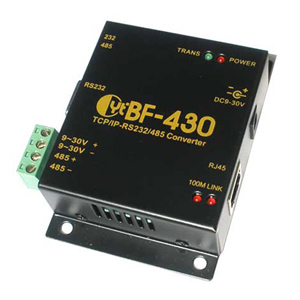 We are also offering a 9V power supply for this converter.